EEG stands for “electroencephalography” which is an electrophysiological process to record the electrical activity of the brain. EEG measures changes in the electrical activity of the brain produced. Voltage changes come from ionic current within and between some brain cells called neurons. An EEG test evaluates the electrical activity of the brain. EEG scans are performed by placing EEG sensors, which are small metal discs also called EEG electrodes, on your scalp. EEG electrodes pick up on and record the electrical activity in your brain. The collected EEG signals are amplified and digitized then sent to a computer or mobile device for storage and data processing. Analyzing EEG data is an exceptional way to study cognitive processes: doctors can use EEG to help establish a medical diagnosis, researchers can use EEG to understand the brain processes that underlie human behavior and individuals can use EEG to improve their productivity and wellness. The billions of cells in your brain produce very small electrical signals that form non-linear patterns called brainwaves. EEG measures electrical activity in the cerebral cortex, the outer layer of the brain. An EEG machine captures this activity during an EEG test.EEG sensors are placed on a participant’s head. The electrodes non-invasively detect brainwaves while the subject wears the EEG device. EEG sensors can record up to several thousands of snapshots of the electrical activity generated in the brain within a single second. The recorded brainwaves are sent to amplifiers then to a computer or the cloud to process the data. The amplified signals, which resemble wavy lines, can be recorded on a computer, mobile device, in a cloud database. Cloud-computing software is considered a critical innovation in EEG data processing, as it allows for real-time analysis of EEG recordings at scale—in the early days of EEG, EEG waves were simply recorded on graph paper. EEG systems in academic and commercial research typically show the data as a time series, or as continuous flow of voltages. In order to map the electrical activity of the brain it is better to get EEG measurements from signals via many different cortical structures located all around the surface of the brain. The electrodes of an EEG device capture electrical activity expressed in various EEG frequencies. Using an algorithm called a Fast Fourier Transform (FFT), these raw EEG signals can be identified as distinct waves with different frequencies. Frequency, which refers to the speed of the electrical oscillations, is measured in cycles per second—one Hertz (Hz) is equal to one cycle per second. Brainwaves are categorized by frequency into four main types: Beta, Alpha, Theta and Delta. The paragraphs below discusses some of the functions associated with the four main brain frequencies. These functions have simply been found to be associated with different brain frequencies—there is no one-to-one linear correspondence between a frequency band and a given function of the brain. Beta waves are most closely associated with being conscious or in an awake, attentive and alert state. Low-amplitude beta waves are associated with active concentration, or with a busy or anxious state of mind. Beta waves are also associated with motor decisions (suppression of movement and sensory feedback of motion). When measured by an EEG device, the signals are often referred to as EEG beta waves. Alpha waves are often associated with a relaxed, calm and lucid state of mind. Alpha waves can be found in the occipital and posterior regions of the brain. Alpha waves can be induced by closing one’s eyes and relaxing, and they are rarely present during intense cognitive processes like thinking, mental calculus and problem solving. In most adults, alpha waves range in frequency from 9 to 11 Hz. When measured by an EEG device, these are often referred to as EEG alpha waves. Brain activity within a frequency range comprised between 4 and 7 Hz is referred to as Theta activity. Theta rhythm detected in EEG tests is often found in young adults, particularly over the temporal regions and during hyperventilation. In older individuals, theta activity with amplitude greater than about 30 millivolts (mV) is seen less commonly, except during drowsiness. When measured by an EEG device, these are often referred to as EEG theta waves. Delta activity is predominantly found in infants. Delta waves are associated with deep stages of sleep in older subjects. Delta waves have been documented interictally (between seizures) in patients with absence seizures, which involve brief, sudden lapses in attention. Delta waves are characterized by low-frequency (about 3 Hz), high amplitude waves. Delta rhythms can be present during wakefulness—they are responsive to eye-opening and may be enhanced by hyperventilation as well. 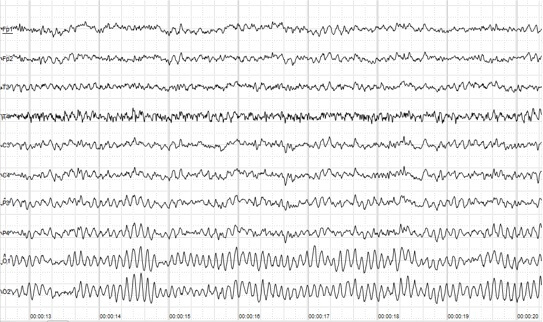 When measure by an EEG device, these are often referred to as EEG delta waves. Your brain is constantly absorbing and processing information even as you sleep. All of this activity generates electrical signals that EEG sensors pick up on. 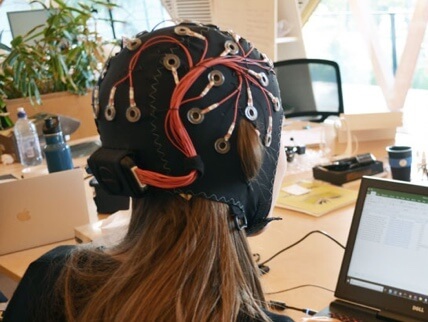 EEG allows for changes in brain activity to be captured, even if there is no visible behavioral response, such as a movement or a facial expression. An EEG monitors changes in electricity that your brain makes, not thoughts or feelings. It does not send any electricity into your brain. Detecting activity across the main cortices of the brain is crucial to obtaining high-quality EEG data. EEG results can be a proxy to assess emotional states affected by external stimuli. Research into the phenomena of electrical activity in the brain was conducted on animals as far back as 1875 when physician Richard Caton published his findings from experiments on rabbits and monkeys in the British Medical Journal. In 1890, Adolf Beck placed electrodes directly on the surface of dog and rabbit brains to test for sensory stimulation. His observation of fluctuating electrical brain activity led to the discovery of brainwaves and led EEG to become a scientific field. The first human EEG recording obtained by Hans Berger in 1924. The upper signal is EEG, and the lower is a 10 Hz timing signal. The field of clinical electroencephalography began in 1935. It stemmed from the research of neuroscientist Frederic Gibbs, Hallowell Davis and William Lennox around epileptiform spikes, interictal spike waves and the three cycles of clinical absence EEG seizures. 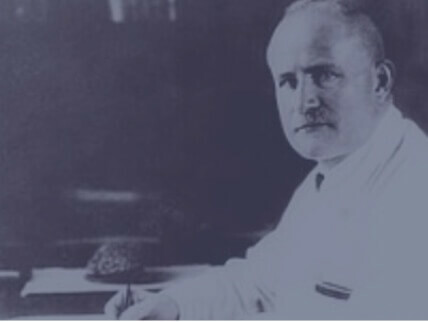 Gibbs and scientist Herbert Jasper concluded that interictal spikes are a distinct signature of epilepsy. The first EEG laboratory opened at Massachusetts General Hospital in 1936. In 1947, The American EEG Society was founded and the first International EEG Congress took place. In the 1950s, William Grey Walter developed EEG topography, a supplement to EEG, which allowed for the mapping of electrical activity across the surface of the brain. This was popular in the 1980s but was never adopted into mainstream neurology. Stevo Bozinovski, Liljana Bozinovska and Mihail Sestakov were the first scientists to achieve control of a physical object using an EEG machine in 1988. In 2011, EEG entered the consumer market when tech entrepreneurs Tan Le and Dr. Geoff Mackellar launched the company EMOTIV. EEG technology such as EEG headsets and EEG caps are components of BCI (Brain Computer Interface). BCI is also referred to as HMI (Human Machine Interface), MMI (Mind Machine Interface), BMI (Brain Machine Interface) and DNI (Direct Neural Interface)—DNI can decode signals from the brain and other parts of the neural system. BCI aims to track cognitive performance and control both virtual and physical objects via machine learning of trained mental commands. In 2017, quadriplegic racer Rodrigo Hübner Mendes became the first person ever to drive an F1 car by using only his brainwaves thanks to an EMOTIV EEG Headset. EEG data can be a powerful tool for consumer insights. Brain responses provide unprecedented consumer feedback—in that EEG is being used to measure the gap between what consumers really pay attention to versus what they self-report liking or noticing. Combining EEG with other biometric sensors like eye-tracking, facial expression analyses and heart rate measurements can give companies an even fuller understanding of customer behavior. The use of neurotechnologies like EEG to study consumer reactions is called neuromarketing. Because EEG tests show brain activity during a controlled procedure, EEG results can contain information used to diagnose various brain disorders. Abnormal EEG data is displayed through irregular brainwaves. Abnormal EEG data can indicate signs of brain dysfunction, head trauma, sleep disorders, memory problems, brain tumors, stroke, dementia, seizure disorders like epilepsy and various other conditions. Depending on the intended diagnosis, doctors sometimes combine EEG with cognitive tests, brain activity monitoring and neuroimaging techniques. EEG tests are often recommended to patients experiencing seizure activity. In these cases, doctors may conduct an ambulatory EEG. An ambulatory EEG records continuously for up to 72 hours, while traditional EEG last 1-2 hours. The patient is allowed to move around in their own home wearing an EEG headset. Extending the recording increases the likelihood of recording abnormal brain activity. For that reason, ambulatory EEGs are often used to diagnose epilepsy (EEG epilepsy), seizure disorders or sleep disorders. An EEG sleep study or “polysomnography” test measures body activity in addition to performing an EEG brain scan. An EEG technologist monitors heart rate, breathing and oxygen levels in your blood during an overnight procedure. Polysomnography is mostly used in medical research and as a diagnostic test for sleep disorders. Since EEG measures electrical activity in the outer layer of the brain (the cerebral cortex), EEG can pick up on brainwaves from your scalp. By combining EEG brain tests with data from other brain monitoring techniques, researchers can gain new insights into the complex interactions taking place in our brains—as well as in our bodies. That’s exactly what quantitative EEG (qEEG) aims to accomplish. 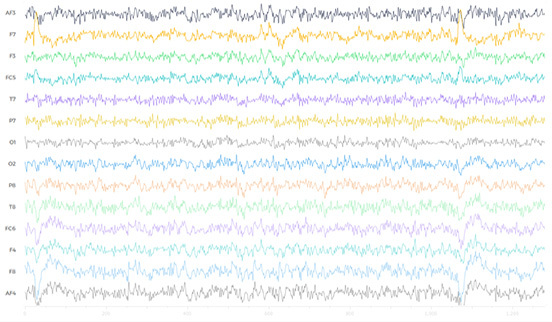 Quantitative EEG records your brainwaves just like a traditional EEG. Using machine learning, qEEG compares your brainwaves with the brainwaves of individuals in the same gender and age range, but who have no known brain dysfunction. 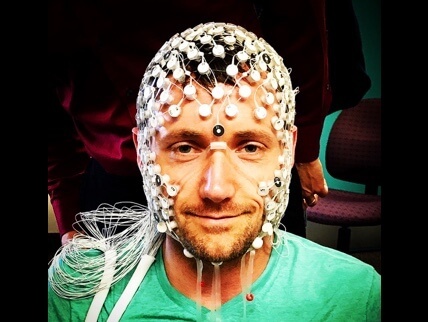 The qEEG process creates a “map” of your brain through the quantitative comparison. EEG electrode placement is a critical part of successful qEEG. Traditional EEG lead placements follow the 10-20 system, an internationally recognized standard for applying the electrodes attached to your scalp. “10-20” refers to the distance between EEG leads being 10% or 20% of the total distance of the skull. The number of electrodes on an EEG device can vary—some EEG recording systems can have as many 256 electrodes. qEEG recordings use a 19-sensor cap to gather data from all 19 areas of your scalp. Because EEG leads amplify signals from the site they’re placed, acquiring qEEG brain mappings identify at the brain level the cause of a dysfunction observed at the behavioral and/or cognitive level. Abnormal EEG results aren’t the only valuable information derived from an EEG test result. 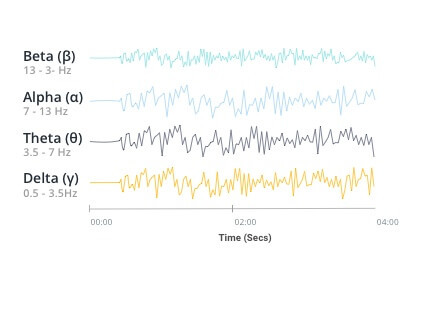 Many researchers use normal EEG in their research, including a groundbreaking 1957 EEG study on brain activity during REM sleep. As introduced in the section on the types of brainwaves EEG measures, studying EEG recordings reveals a range of frequencies contained within brain signals. These frequencies reflect different attentional and cognitive states. For example, researchers have monitored gamma band activity (often associated with conscious attention) while investigating neurological responses during meditation (eeg meditation). Gamma band activity is associated with peak mental or physical performance. Having been observed in experiments where a subject wearing an EEG device is practicing deep meditation, there is a theory that gamma waves are associated with conscious experiences or transcendental mental states. There is no agreement among academic researchers around what cognitive functions gamma band activity is associated with. Researchers need a way to process and handle all the wealth of brain data they collect—and even share it with different institutions. “Neuroinformatics” is the field of research that provides computational tools and mathematical models for neuroscience data. Neuroinformatics aims to create technologies for organizing databases, data sharing and data modeling. It concerns a diverse amount of data, as “neuroscience” is broadly defined as the scientific study of the nervous system. 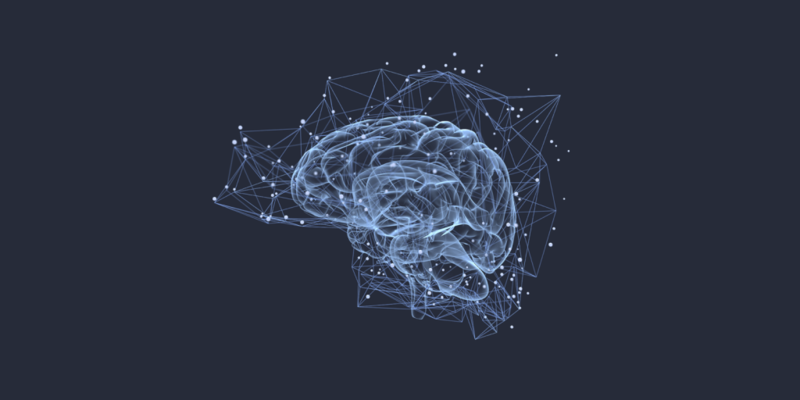 Neuroscience’s sub-disciplines include cognitive psychology, which uses neuroimaging methods such as EEG to analyze which parts of the brain and nervous system underlie which cognitive processes. The following sections on EEG monitoring and EEG interpretation and results include information for audiences undergoing EEG tests in a healthcare setting. The best way to prepare for an EEG test is always to ask the test administers for specific preparation instructions. Instructions for EEG preparation can vary by use case—for example, EEG recordings for consumer research, academic research or performance and wellness may require subjects to be active instead of lying down. 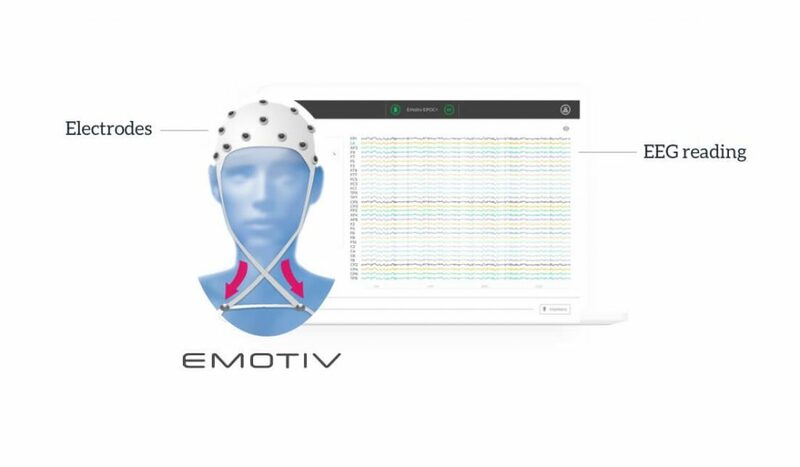 Companies like EMOTIV have pioneered advances in EEG technology that make conducting, processing and interpreting EEG tests faster and more convenient. EMOTIV’s mobile and wireless EEG headsets can be set up in less than five minutes, and they enable the participant to move freely instead of confining them to a testing facility. In advance of an EEG test, tell the professional administering the test—whether that’s a doctor, employer or researcher—about any regular medications you take. It’s recommended that you wash your hair the night before the procedure and leave it free of any products. Avoid drinking or eating any caffeine at least 8 hours before the test. If you have to sleep during the EEG procedure, you may be instructed to limit your sleep the night before to ensure your brain can relax properly during the test. You’ll feel no pain or discomfort during an EEG procedure. During a clinical EEG procedure, you’ll be lying on a bed or a reclining chair and instructed to close your eyes. An EEG technician, someone who installs EEG systems, measures your head and marks where to apply the EEG leads. When the test begins, the electrodes record your brainwaves and send the activity to a recording machine. The EEG machine then converts the data into a wave pattern for EEG interpretation. After the recording is finished, the technician will remove the electrodes from your scalp. Routine EEG tests in scientific or clinical settings take 30-60 minutes to complete, including around 20 minutes of initial set-up time. EEG tests conducted for consumer, individual performance and workplace research can be shorter or longer in duration depending on testing purposes. EMOTIV’s wireless EEG headsets support quicker set up for these use cases (less than five minutes). There should be no recovery time needed after an EEG procedure. If you’ve taken a medication that has caused drowsiness in order to sleep during the EEG test, the test administer may recommend waiting at the facility until the effects have worn off or have someone drive you home. EEG test side effects are rare. The electrodes don’t produce any sensations; they only record brain activity. Persons with epilepsy may experience a seizure from stimuli such as flashing lights during the procedure. A seizure during an EEG test is nothing to be scared of—it can actually help doctors diagnose the type of epilepsy and tailor the treatment recommend. If you’ve been recommended an EEG test for clinical reasons, your EEG test results will be interpreted by a doctor who specializes in the nervous system. The neurologist will study the recording for normal and abnormal brain patterns. Brain wave patterns are very recognizable by the characteristics of their waveforms. For example, a burst suppression EEG pattern, which is often observed in patients with inactive brain states such as from coma or general anesthesia, shows brief spikes (the burst) alternating with periods of flatness (the suppression). Different types of epilepsy are characterized by distinct EEG patterns. 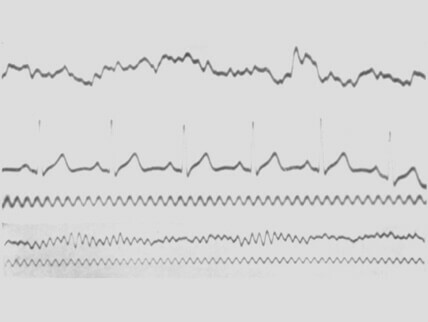 A spike-wave pattern—a generalized, symmetrical EEG pattern—is often observed duringabsence seizure, where a person experiences a brief loss of consciousness. A partial focal seizure, in which seizure activity only affects one area of the brain, is characterised by a low-voltage, fast rhythm pattern that appears in the EEGs data channel associated with that area. The neurologist then sends the EEG test results back to the doctor who ordered the test. Your doctor may schedule an appointment to review the EEG images and discuss the results with you. Depending on your condition, you may be recommended a service called EEG neurofeedback or biofeedback as a follow-up. Biofeedback therapy helps subjects control involuntary bodily processes. A subject experiencing, for example high blood pressure, can view their bodily measurements on a monitor that’s receiving data from electrodes on their skin. Monitoring this activity helps teaches relaxation and mental exercises that can alleviate symptoms. Similarly, Neurofeedback relies on EEG to train the brain to function better. During this training, the patient is hooked up to an EEG machine and is viewing their brain activity in action. This often resembles a type of video game where the patient is “playing” the game with their brain to control their brain activity. The patient tries to improve the brain frequencies associated with the brain dysfunction—the same way an athlete works on a weak muscle. EEG neurofeedback is often recommended for conditions such as epilepsy, bipolar disorder and autism. It can help these disorders but cannot cure them. EEG machines come in the form of a few different wearable EEG devices. At the highest level is the difference between clinical EEG devices (used in a healthcare and scientific research setting) and consumer EEG devices (used in consumer research, academic research and performance and wellness). Wearing a clinical EEG device, participants cannot move, and the data needs to be collected in a controlled and shielded environment to avoid distorting the signal. 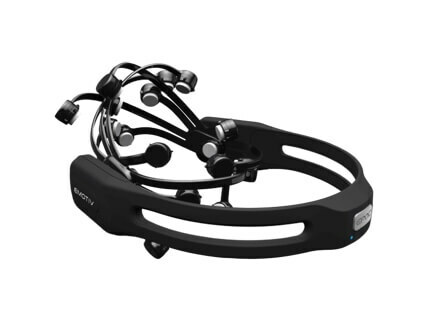 Consumer EEG devices like EMOTIV’s wireless EEG headsets allow users to monitor brain activity anywhere. The variation between different types of wearable EEG devices is necessary to support the requirements of professionals who use EEG systems and the settings in which data is collected. For example, neurologists and neuroscientists often need a higher density of sensors to perform their data analysis than a consumer researcher might. In addition to EEG electrode placement, there are a few other notable variations between EEG systems to consider. What’s the difference between an EEG cap and an EEG headset? The main difference between these two most common types of wearable EEG devices is in the number of electrodes. EEG headsets usually range from 5-20 electrodes. EEG caps can support more sensors, as they have a larger surface area for EEG electrode placement. 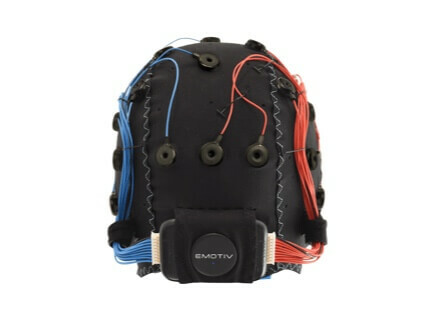 EEG caps like the Emotiv EPOC FLEX offers movable sensors for flexible positioning. Sensor configuration in the Emotiv INSIGHT and EPOC+ headsets is fixed. In the early age of EEG, patients had to be hooked up to the EEG machine in a clinical setting. Now, wireless EEG tests are possible, as EEG signals can be digitized and sent to the recording machine like a smart phone, a computer or the cloud. Tests can be conducted in a variety of environments using portable EEGs. You can conduct an experiment where subjects wear wireless EEG headsets and walk through a park, and your subject’s movement will only be limited by the data transmission range. If you need to control the test environment to administer stimuli such as flashing lights, you may opt for a clinical setting—in which case, there are no limitations to using a wired EEG machine. EEG has very high temporal resolution compared to fMRI. It can pick up the rapid reactions of the brain that happen at the speed of milliseconds, which allows it to sync very accurately what happens in the brain and in the environment. Significantly lower hardware costs and total cost of ownership (TCO). EEG data is collected non-invasively unlike electrocorticography, which requires neurosurgery for electrodes to be placed directly on the surface of the brain. Mobile EEG sensors can be used in more places than fMRI, SPECT, PET, MRS, or MEG, as these techniques rely on heavy, costly and immobile equipment. High temporal resolution of EEG (milliseconds rather than seconds). EEG is recorded at sampling rates between 250 and 2000 Hz in clinical and research settings. More modern EEG data collection systems can record at sampling rates above 20,000 Hz if desired. EEG is silent, to allow for studying of the responses to auditory stimuli. Compared to fMRI and MRI, there is no physical danger around an EEG machine. fRMI and MRI are powerful magnets which prevent use by patients with metallic gear such as pacemakers. fMRI, PET, MRS and SPECT can aggravate claustrophobia which can corrupt test results. EEG does not induce claustrophobia as subjects are not confined to a small space. Consumer EEG scans allow for more subject movement during testing, unlike most other neuroimaging techniques. EEG does not involve exposure to radioligands, unlike positron emission tomography, or high-level magnetic fields like MRI or fMRI. EEG does not involve exposure to high-intensity (>1 tesla) magnetic fields. Compared to behavioral testing methods, EEG can detect covert processing (processing that does not require a response). Compared to behavioral testing methods, EEG can be used in subjects who are unable to make a motor response. EEG has a low barrier of entry for consumer use so it is a powerful tool for tracking and recording brain activity during different activities of daily life, allowing for a near limitless number of EEG applications. EEG sleep analysis can indicate significant aspects of the timing of brain development, including evaluating adolescent brain maturation. There is a better understanding of exactly what signal is measured with EEG, compared to the BOLD (Blood-oxygen-level-dependent) imaging used in fMRI. EEG technology has been adapted to the gaming world for both medical and entertainment purposes. Companies are using EEG to provide ways of interacting with video games in VR, AR and through BCI. EEG machines detect the signal and the algorithms in the software interpret your brainwaves to control your avatar on screen. 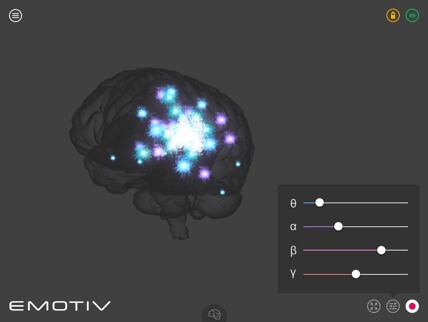 EMOTIV’s EPOC headset is the first high-fidelity brain computer interface (BCI) that can monitor and interpret conscious and unconscious thoughts and emotions. 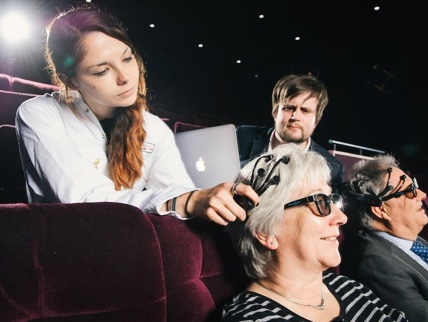 The BCI can detect the complex brainwaves of 30 different expressions, emotions and actions. This detection is achieved through machine learning. Machine learning algorithms have been trained to recognize the brain patterns that occur while the EEG participant processes the various expressions, emotions and actions. When the algorithms pick up on an EEG brainwave in its data set, the BCI can associate the pattern with a physical or digital command. For example, thinking a trigger word like “push!” will command your avatar will push an object out of its path. EEG ADHD training programs use neurofeedback to “exercise” the brain. Subjects wear an EEG headband while playing EEG VR games especially designed to enhance cognitive skills or control physical objects – such as a drone or race car – by triggering events using thoughts with mental command detection. Open source EEG applications are barely starting to break the surface of possibility and developers are increasingly using EEG SDK’s to find new and amazing possibilities for EEG gaming.